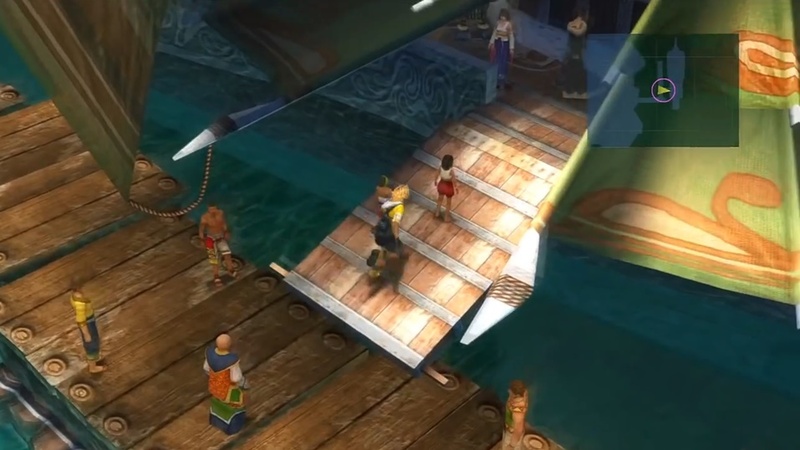 A complete walkthrough for S.S. Liki in Final Fantasy X (FFX), including enemies encountered, obtainable items, and boss strategy guides. Potion (x20) Kick the suitcase on the ground to get a Potion in the room to the left of the stairs. You can only keep getting Potions until you have 20 in your inventory. Al Bhed Primer vol. III Lower right corner of the Power Room. 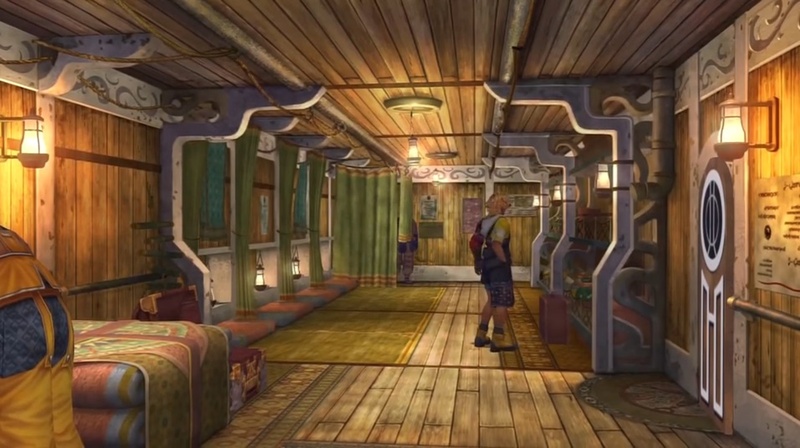 Proceed to the front deck of the ship and talk to Wakka. Go down the stairs at the back of the ship. 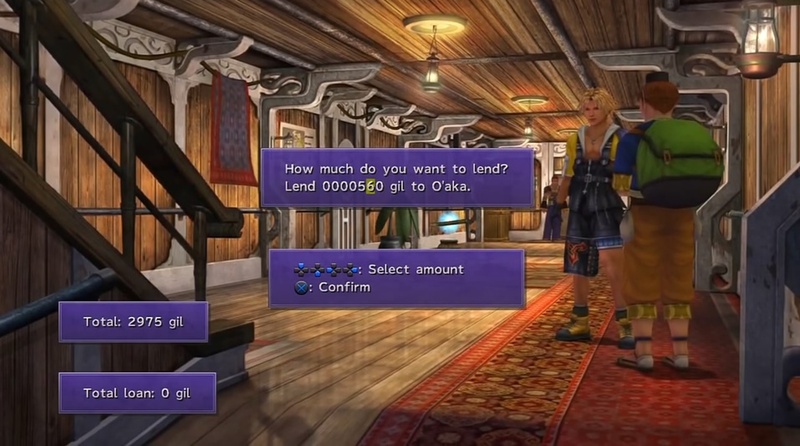 Lend O’aka XXIII some money. Head to the Power Room. Return to the front deck and talk to Yuna. Talk to the man not wearing a shirt before the bridge to get 400 Gil as a farewell gift. Lending at least Gil to O’aka XXIII every time he appears allows you to lower the prices of items he and his brother will sell you. O’aka is a travelling merchant and found in various locations throughout the game selling different wares depending on where he is found. The table below summarizes the effects of lending O’aka XXIII money throughout the entire game. After going down the stairs from the upper deck, head to the room on the left. You will find a suitcase inside. Kick it as many times as you want to get Potions, though you will stop getting any more if you have 20 in your inventory. These will be very handy in the boss fight ahead. Enter the Power Room next to O’aka XXIII. You can talk to the caretaker inside to learn about Chocobos. 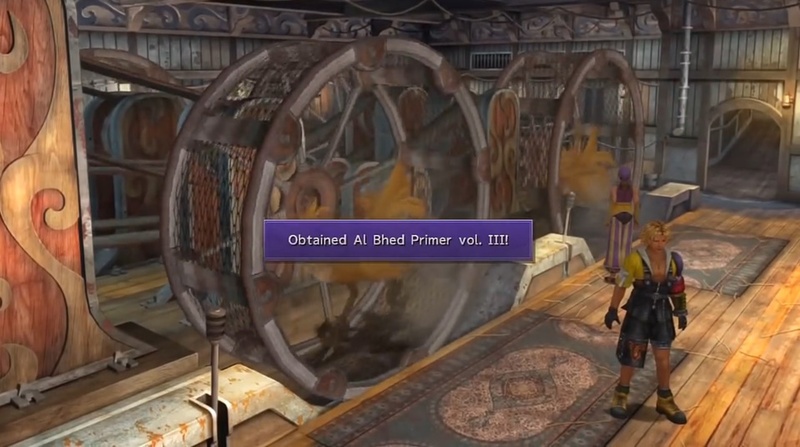 Head to the lower right corner of the room to get the Al Bhed Primer vol. III. Sin’s Fin will be accompanied by a few Sinscales that are very easy to defeat. Similar to the encounter in Zanarkand, the Sinscales will glow to indicate that they are readying to unleash a powerful attack. Defeat them before they attack. It is advised to save your Overdrives for the next battle. To deal with Sin’s Fin, switch to Lulu, Wakka, and Kimahri and focus your attacks on it. 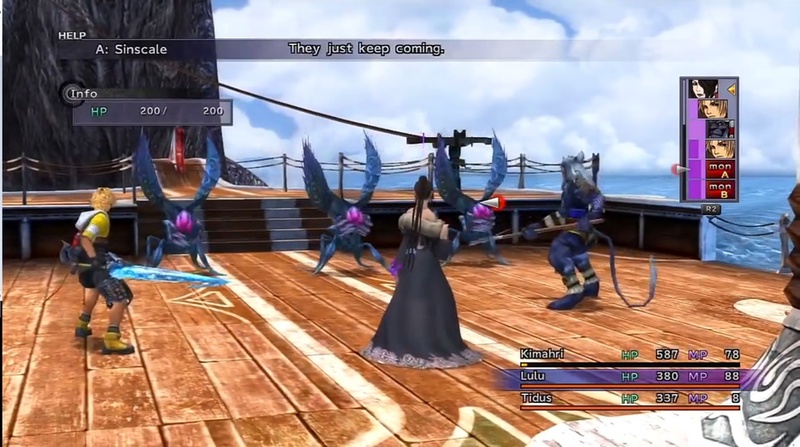 Have Lulu bombard the boss with magic, Wakka with normal attacks, and Kimahri repeatedly cast Lancet on it. It is not advised to use any Potions during this battle since you will only have Tidus and Wakka in the next boss fight who both have no healing spells. Have Yuna cast cure instead to heal any struggling allies. Like Sin’s Fin, Sinspawn Echuilles will be supported by Sinscales. Ignore the small enemies as defeating one will cause new ones to appear. Concentrate instead on damaging Sinspawn Echulles. 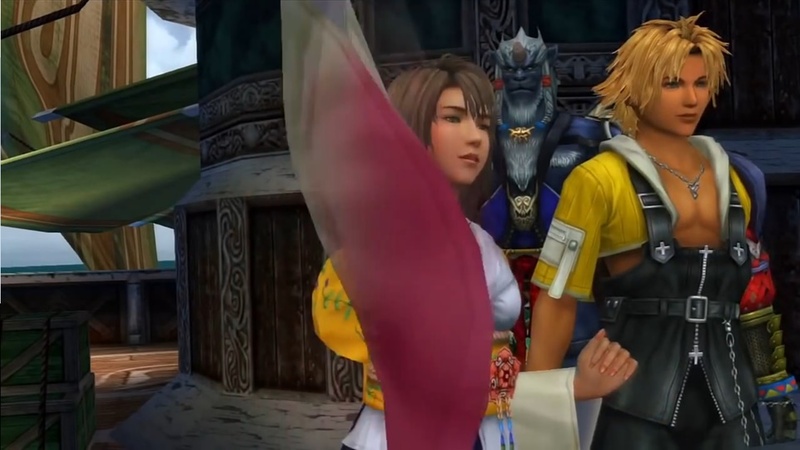 Have Tidus use Cheer to buff your attack and defense. Unload all Overdrives on Echuilles and heal with Potions when your HP gets too low. 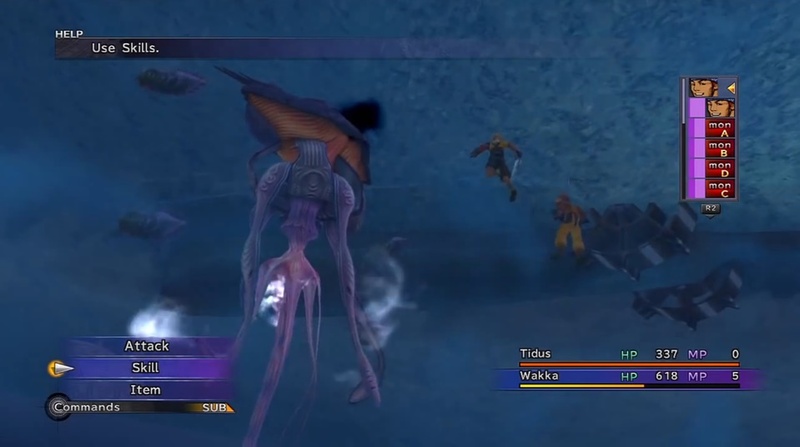 Using Wakka’s Dark Attack can blind Echuilles and make him miss attacks.